The Crooked River is located in central Oregon and is known for the abundance of Rainbow Trout. It is said to contain about 3,000 fish per mile, which would increase anyone’s chance of catching some fish. The river starts just below Bowman Dam located at Prineville Reservoir located near Bend Oregon. The Crooked eventually dumps into the Deshutes River. This is a very scenic river. The best part of the river starts about 9 miles below Bowman Dam near Prineville. This section holds the most fish and it has nice runs, pocket water and long riffles. Although the Rainbow Trout on this river usually only range between 8” and 12” the river is perfect for the beginner. The river has good access and the fish love the dry flies witch will provide a great experience to the new fly-fisherman and get him hooked. The season is year round but the fishing is usually best in the fall and winter months. You won’t find the biggest fish in this river but you will have fun catching many. 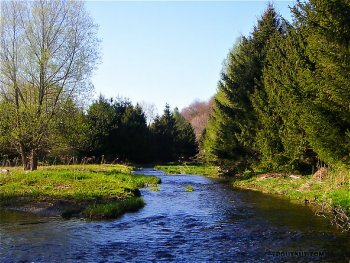 Like many other streams, the water flows on this river really determine the quality of fishing. When the flows are recently consistent the fishing can be very good. There are good hatches in the spring and summer of Mayflies, Caddis and midges. The Scuds are usually around year round providing year round nymph fishing. Some of the nearby cities include Prineville, Madras and Redmond Oregon. Leave the Crooked River page and return to Oregon page.